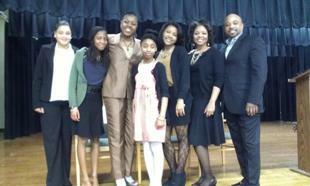 held at James Madison Middle School on Friday, March 22, 2013. Savannah is making her mark in women's history. Great job Savannah! Primary driver for the WIZ Racing Team. Geneva has been driving since 1998. She began fulfilling her dream in a 1968 Camaro, powered by a 434 Small Block Chevy engine. One year later she allowed the team to add a nitrous power booster. They quickly realized she had a true knack for driving and built her second car, (a 1967 Camaro) enhanced with more horsepower. “GEE WIZ” soon excelled, by flaunting passes well below the 9 second zone. Subsequently, this achievement encouraged her team to build her third 1968 Camaro. This car campaigns a 632 Fulton Big Block Chevy engine. Further, the performance is reinforced by a power glide transmission combined with a 9 inch Ford Rear and four link suspension, blasting the Camaro in the mid 7.30’s (1/4 mile). “GEE WIZ” races primarily on the East Coast, participating in the Outlaw 10.5 series. She is the fastest female on a 10.5 tire. Her race goal is to break the 200 mph barrier. “HER TEAM”: WIZ Racing is family owned and internally sponsored. Her brother Emerson Jr. – “THE WIZ” is her Crew Chief and the secondary driver for the team. She attributes everything she knows about the incredible sport of drag racing to this amazing mentor, teammate and friend. Her other brother, Kelvin – “WIZ TOO”, serves proudly as Co-Crew Chief and travels untiringly to be at her side. Her sister and best friend, Brenda is her Public Relations Representative and also part of her crew. Her parents, Emerson Sr. and Betty, faithfully attend her races and support her ever evolving dream to become a professional drag racer. Her precious miracle son, Jayden – “WIZ KID” is the fire that fuels her passion. Jayden was born weighing in at 1 pound. The toddler now considers himself “race-ready” and anxiously waits in line to be the next generation of drivers in the WIZ camp. The rest of her extremely dedicated, diverse and faithful crew members are truly special to “GEE WIZ” as she unhesitatingly trust them with her life as they piece every critical aspect together for a safely executed pass. GOD Bless and Special Thanks for ALL you do to: Jack, Derrick, Uncle Sonny, Frank, David, Kim and her twin parachute packers, Amanda and Ashley. 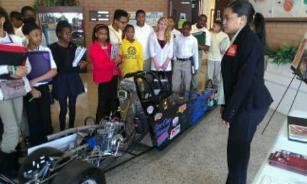 On Aug. 4, 2012 Tia Norfleet became the first African-American woman to race in NASCAR. She placed 23rd out of 25 competitors at the CMC Supply Twin 100s at Motor Mile Speedway in Fairlawn, Va.
Tia is the daughter of NASCAR pioneer Bobby Norfleet and races for her father's team. 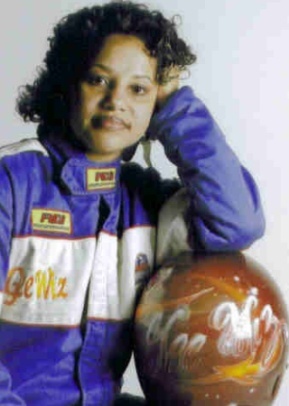 In 2005, Nicole Lyons became the first African American Female in professional stock racing. a well-known street racer, and she shared his passion for all things car-related.